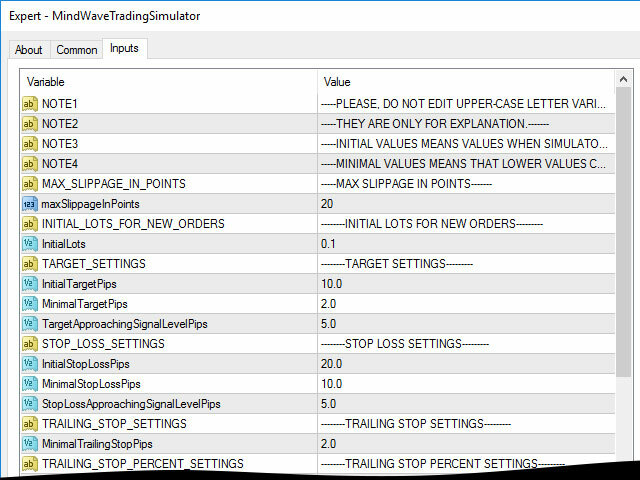 Mind Wave Trading Simulator is a training/trading utility for MetaTrader 4 that runs in both tester and real trade modes. 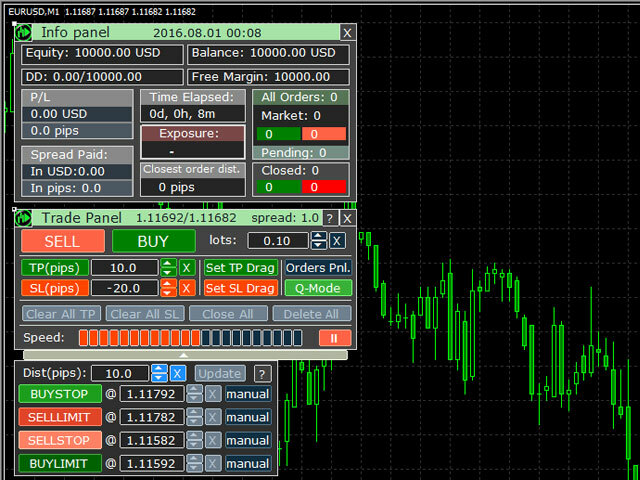 It extends MetaTrader 4 functionality and makes trading easier in both tester and real trade modes. When used in the MetaTrader 4 tester, it offers traders an opportunity to practice and train their manual trading skills in accelerated speed. No need to wait for hours and days in real time demo trading to evaluate some manual trading strategy. Setting Take Profit, Stop Loss not only in price levels, but also in pips relative to order open price or current price (depending on the case) as well. Setting pending orders open price levels as a distance in pips from the current price. Percent Trailing Stop for market orders in addition to pips Trailing Stop. Equity Target and Stop Loss. This feature closes all market orders when equity reaches a level, defined by a user. It may be under the current equity or over it. Equity Trailing Stop. 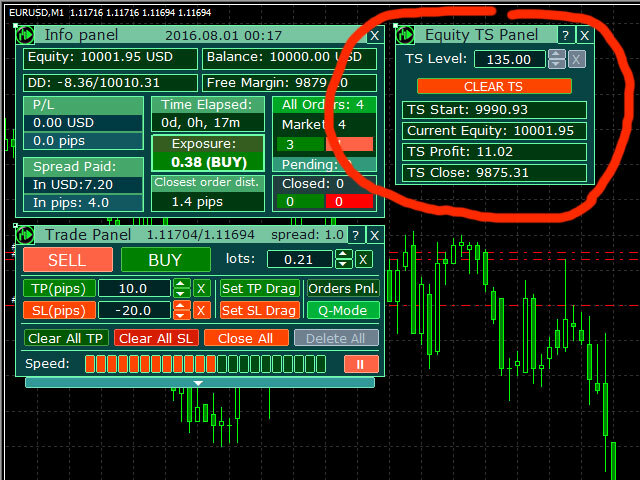 This feature closes all orders when equity level drops by specified amount from the highest level achieved after the Equity Trailing stop was turned on. It works just like an order trailing stop, but applied to equity movements, not individual order price movements. Moving Trade Widget, which can place pending orders on the price level, corresponding to the position on the chart, where the widget is located at the moment. When it hovers over an existing order, it allows this order to be modified, closed or deleted. It can place market orders as well. 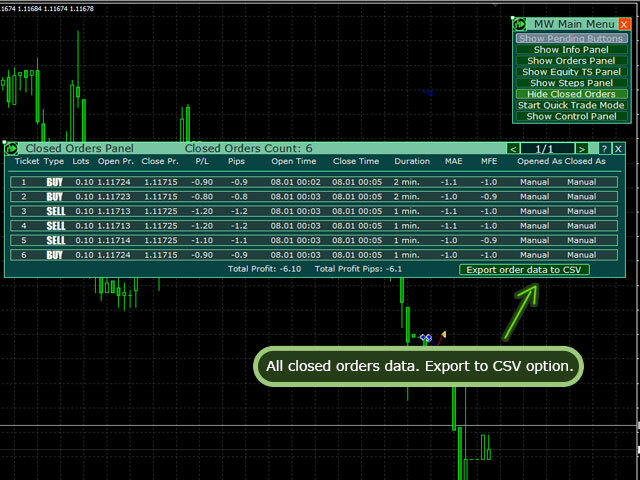 Setting Take Profit, Stop Loss and pending order open price levels by dragging lines, instead of entering values. Individual order report, including MAE, MFE, market duration time, pending duration time, method of opening (market order or pending order activation), method of closure (manual closure, Take Profit hit, Stop Loss hit, Equity Trailing Stop closure) and other data. Mass Close and Delete buttons. Mass Take Profit Removal buttons and Mass Stop Loss Removal buttons. Exposure Meter. Calculates your current aggregate exposure (risk) based on all market orders. Example: BUY 0.1 EURUSD + BUY 0.15 EURUSD + SELL 0.2 EURUSD = BUY 0.05 EURUSD aggregate exposure (risk). Spread Paid indicator. Shows spread expenses in money and pips. 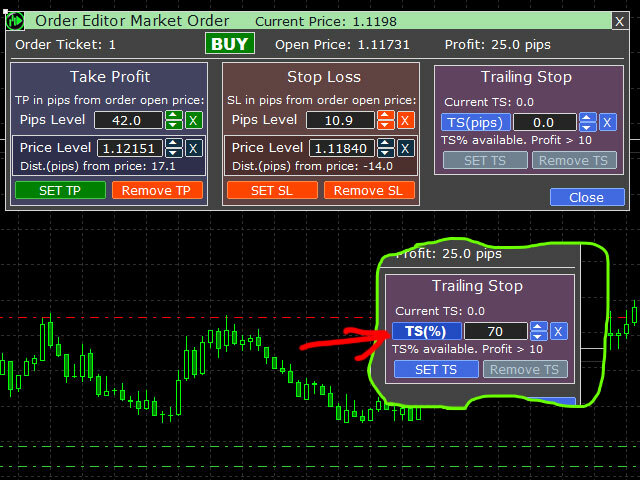 One click removal of Take Profit and Stop Loss for any order, or two clicks to set them as an offset from current price (for market orders) by predefined (in input settings) offset steps. The user interface consists of panels corresponding to specific feature, which can be shown or hidden according to user's preferences. maxSlippageInPoints - maximal slippage in points, above which a trade will not be placed. InitialLots - initial volume of new orders. It can be altered during runtime. InitialTargetPips - initial target in pips for new orders. 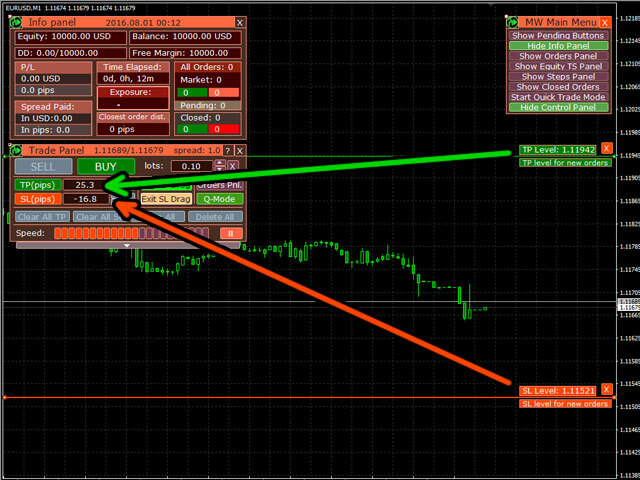 MinimalTargetPips - minimal order target (TP) in pips, which can be set. TargetApproachingSignalLevelPips - pips threshold for visual indication of approaching take profit level. InitialStopLossPips - initial stop loss in pips for new orders. MinimalStopLossPips - minimal order stop loss in pips, which can be set. StopLossApproachingSignalLevelPips - pips threshold for visual indication of approaching stop loss level. 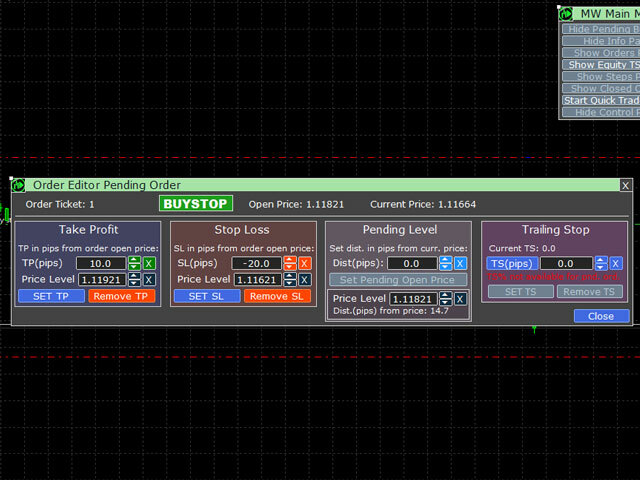 MinimalTrailingStopPips - minimal Trailing Stop level in pips. MinimalTrailingStopPercent - minimal Trailing Stop percent value. 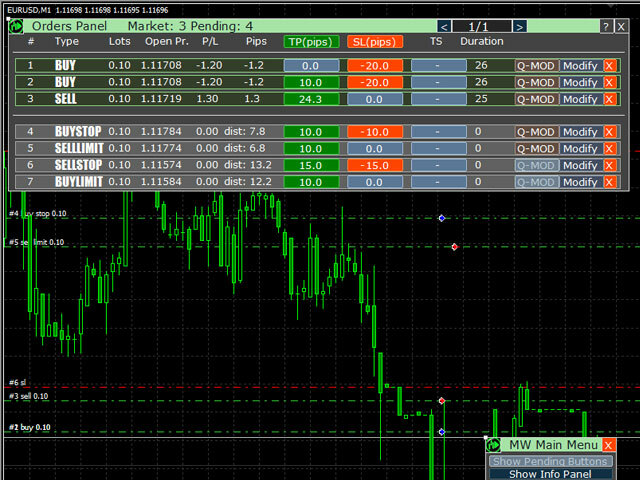 MinimalPipsProfitForTrailingStopPercent - minimal profit in pips necessary to enable percent trailing stop option for market orders. InitialPendingOrderOffsetPips - initial pending order open price offset of current price, in pips. 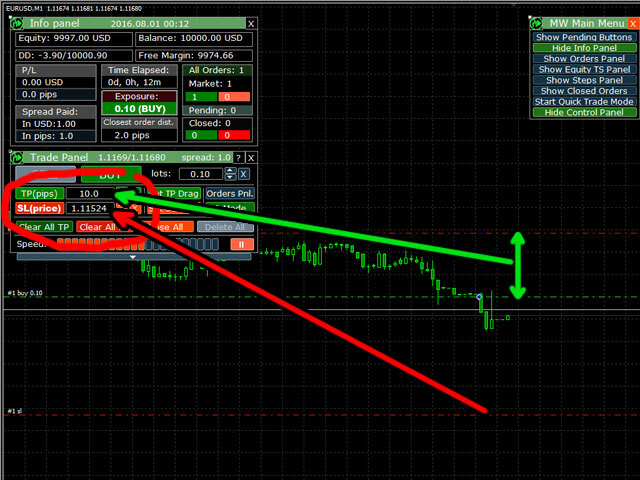 MinimalPendingDistancePips - minimal pending order open price offset of current price, in pips. PendingOrderApproachingSignalLevelPips - pips threshold for visual indication of approaching pending order open price. 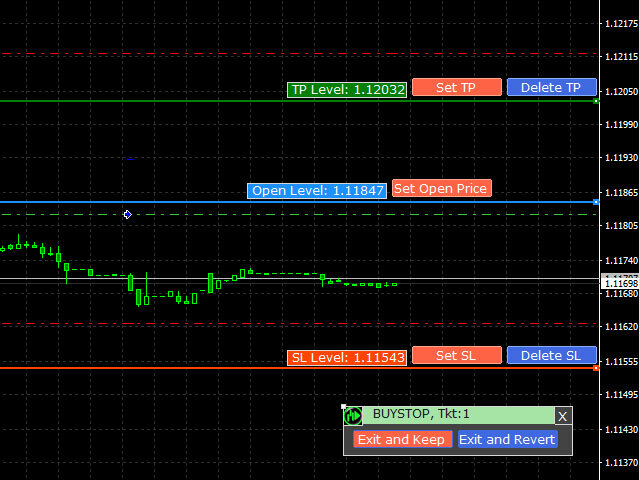 QuickEditorStartLevelPips - start level in pips for quick order TPSL setting like offset of the current price. 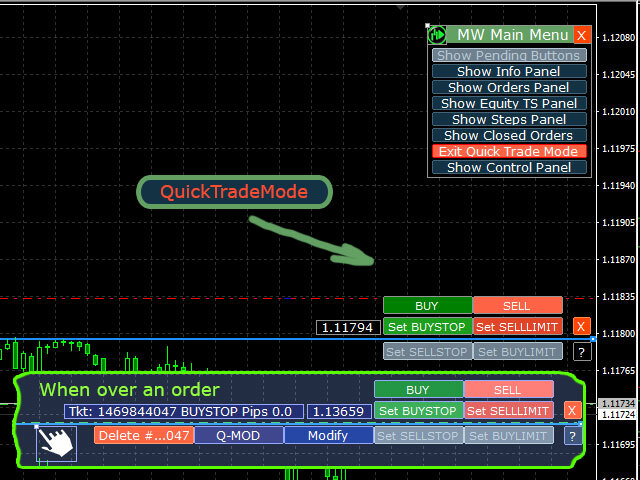 QuickEditorStepPips - step in pips between quick order editor TPSL levels. QuickEditorPercentTSStartLevel - start level in percent for quick order trailing stop setting. 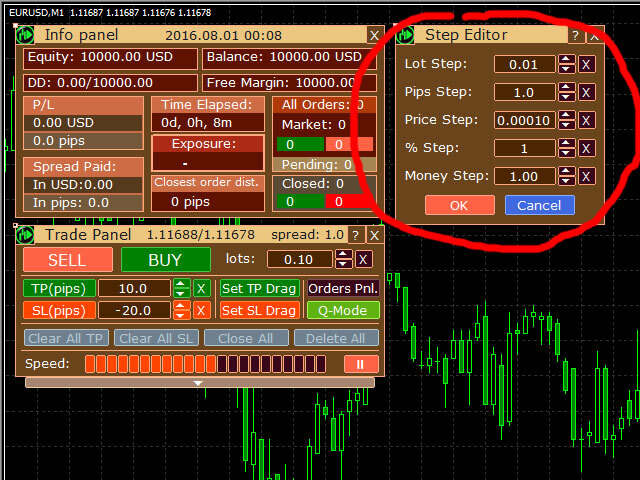 QuickEditorPercentStep - step in percent between quick order editor trailing stop levels. A powerful product! Thank you. Optimized for working with CFD and indices.